Wire is one of many innovative materials that you can use for crocheting. Wire is a fantastic material to use for crocheting jewelry, but you can use it for many other creative projects too. What Wire Should You Use for Crochet? In my experience, thick wire is challenging to work with; you don't want to put your hands through the strain of crocheting with wire that is too heavy. So with that in mind, you'll want to work with thin wire -- perhaps in the range of 26 to 28 gauge. I've also seen projects made using 24 gauge wire. Wire comes packaged in many different ways. Sometimes you find it packaged on spools, as pictured here. Sometimes you can find value packs comprised of much smaller spools of wire. Sometimes you find packages of wire where the wire is simply coiled; it isn't on a spool at all. I'm sure there must be other ways of packaging wire, but so far those are the kinds I've used. All have their advantages and disadvantages. So far, my favorite is the larger spools pictured at left. There's enough wire on the spool to make most projects I would want to make, and it's easy to unwind wire as needed. I also love working with the smaller spools from the wire value packs, but they only work for projects where a small amount of wire is needed. Also, there tends to be quite a bit of waste in proportion to the amount of wire present. 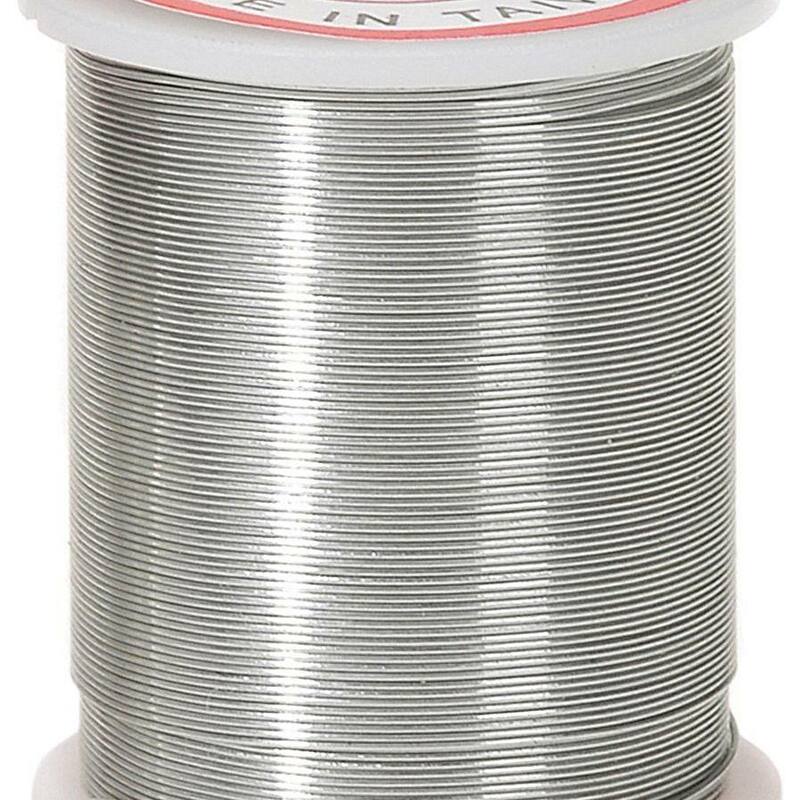 After crocheting a project with one of these spools, I've often found that I have a piece left over at the end that's a significant length of wire yet it's too short to do much of anything with. Also, there is an excessive amount of packaging with this type of wire, which could potentially have an impact on the environment -- depending on what you do with the packaging afterwards. I tend to keep the used-up spools so I can use them for winding more wire or embroidery floss later, so the spools aren't wasted. I also keep pieces of leftover wire in hopes that I'll eventually find a creative use for them. My least favorite is the loosely coiled wire without any type of spool. It's problematic because it can tangle and become challenging (or impossible) to sort out. I've taken to keeping empty spools after I've used them up, and then winding my coiled wire onto the empty spools as needed. That's worked well for me, but it is time-consuming to do. The wire packaged in this way does have a couple of advantages. One is its lower environmental impact (more wire, less packaging.) The other is that they tend to give you a lot of wire for the price; so far I've found it to be a pretty good value, assuming I don't lose too much of it to tangles and snarls. Which Crochet Hook Should You Use for Wire Crochet? The hook must be really sturdy. The hook should be one you don't mind damaging or breaking all together, in case something goes terribly wrong. Absolutely do not use a hook that has sentimental value or significant monetary value. You could end up regretting it. When yarn creates friction against your crochet hook, it's unlikely to cause any significant damage. You can't say the same for wire. When wire chafes against your hook, it could peel off any coatings or paint that may be present on the outside of the hook. It's possible that a delicate hook could crack or outright snap and break. I tend to use either small steel crochet hooks or cheap aluminum Boye hooks for wire crochet. I am sure there are other acceptable choices, but those are the ones that I've had success with so far. Which Beads Should You Use for Wire Crochet? You don't have to use beads when you crochet with wire, but beads do combine nicely with wire to make jewelry and other projects. There are so many types of beads available, and so many things you could make, that it's hard to give a definitive answer about which ones are "best." Some of my favorites are as follows, but there are plenty of other amazing possibilities that would work well. I love the effect of stone bead chips when paired with wire crochet techniques. You can see examples of this in my rose pink beaded wire crochet bracelet (pictured at left), my red coral crochet bracelet, and my stone bead chip necklace with dichroic glass pendant. I also love the look of freshwater pearls with wire crochet. You can see an example of how they look together in my freshwater pearl necklace. One thing I find interesting is that, with both of these types of beads, the bead shapes are not uniform; they're all different. With that in mind, it seems to me that you could try experimenting with bead mixes where the bead sizes and shapes are different, and that might also give you fantastic results. I really like glass seed beads for use with wire crochet, and I've had success with other shapes and sizes of glass beads as well. I can tell you with certainty which kind not to use: that is, any kind of bead that has a coating on the outside that could come off -- like these metallic seed beads by Darice. These are not good for wire crochet, for all the reasons I explain in my product review of the beads. Check out these free wire crochet necklace patterns for bunches of different ideas. Discover a free pattern for a wire crochet flower pendant. You could crochet napkin rings using wire. Another idea: you could combine wire and other materials to make your napkin rings, or to make other projects. Pictured here is a napkin ring that's made using a combination of wire and pull tabs that were harvested from cat food can lids. I crocheted into the open spaces of the pull tabs using the wire to achieve this effect. Pictured at left, you can see the napkin rings holding a rolled vintage cloth napkin. You can get the free napkin ring pattern and instructions on our website if you would like to make yourself a set of these. Ornaments are another ideal type of project you can crochet out of wire. The snowflake ornament at left is crocheted using wire as a part of the framework. The technique used to make it is different than the usual wire crochet technique, but you could use either technique for making your ornaments. I haven't ever crocheted a wire basket, although I think it would be an interesting project. Off the top of my head, I don't know of any patterns available for this, but you could try adapting another type of basket pattern to see if that would work. The gauge and materials list would obviously be all wrong, but you might be able to get interesting results you're adventurous and willing to take some risks. Can't you just imagine, a beautiful wire bowl filled with fruit on your countertop or coffee table? How lovely would that be? Please use caution and common sense when crocheting with wire. Take frequent breaks. Stretch your hands often. If you experience any pain in your hands, it is best to put safety first and discontinue working on the project until your hands heal completely. You only have one pair of hands, and so you have to take good care of them. Another caution: it's difficult to unravel wire crocheted pieces. It isn't totally impossible in every case, but in many cases, unraveling just plain doesn't work. Most of the time, it's going to be better to just leave a mistake in place and work around it, than it is to try to unravel and rework it. So, crochet carefully, and be prepared to lose some pieces if you make mistakes in your work. These sorts of losses happen to everyone I've talked to who does wire crochet, so when it happens to you, know that you are in good company. With wire crochet, it's all right if you ignore your inner perfectionist and just keep crocheting, despite any imperfections or outright mistakes that may happen. At Fire Mountain Gems: Their article crochet with wire is a helpful resource, and they also sell wire and beading supplies you can use for crocheting with wire.